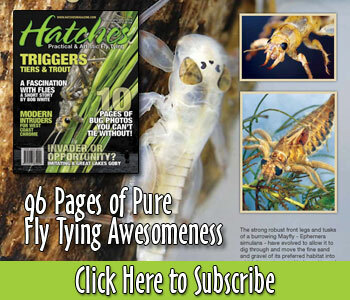 Check out Joshua Williams’ take on a Zebra Midge, and easy but extremely effective pattern for nymph fishing. The Zebra Midge is a great fly to use as a dropper, especially in tailwaters. Midges hatch year round, making them one of the few species that can be used in the winter as well. The most common sizes to be equiped with should be in the #18-24 range in any color that works well. Great additions I include are always using an Ice Dub collar and applying Clear Cure Goo for added shine and durability. Neat little fly! Easy tie, and I know these little patterns work. I often use as a dropper on a nymph/scud rig too. I like the way you brace your hand with a finger or two on the vise for trimming. I find that helps me too. And do a little plug for that Hareline bead pad. I love mine. Thanks for a very good video. Oh yeah, I often use a strand or two of Krystal Flash as a body wrap. Talk about visible! ANd lots of colors to chose from. This simple fly opened a new way to fish for trout on spring creeks, and last May gave me one of the best mornings ever. I use Ostoff’s sliding foam indicator, and set it so the Zebra Nymph rode just a couple of inches above the bottom. Fish after fish nailed it, the best one a 15″ brown, and on one pool I took three fish on three successive casts. Love it! Words are truly inadequate to convey the respect I have for you. Best of luck! Very impressed. What a nice add this will make to my box! Pretty new to this side of the sport! Actually very new to fly fishing in general! The impossible does not exist. Well done. Good fly and an amazing display of dexterity,courage, and tenacity. I admire you. Amazing simple fly that works very well and an excellent production.